FREIBURG, Germany – July, 2010 – Paragon Software Group, a leading software developer for mobile devices and desktop computers, and Encyclopaedia Britannica, Inc., a leading educational publisher, announce the immediate release of Britannica Concise Encyclopedia 2010 2.0 for iPhone, iPod touch and iPad. The new concise version of one of the world’s most trusted encyclopedias includes the latest content, nearly 2,000 new maps and images, categorization of search results, new search options, and new interface features. 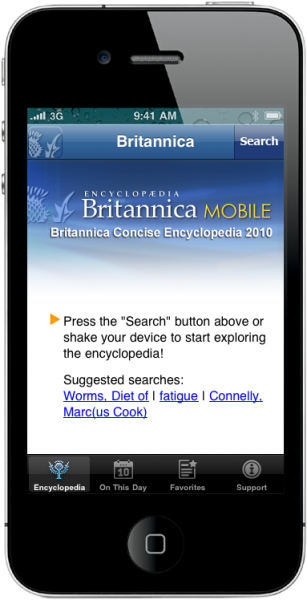 The Britannica Concise Encyclopedia 2010 for iPhone, iPod touch, and iPad is the most reliable and comprehensive learning and reference source of information on the go, requiring no Internet access and minimal memory space. Prepared by the editors of the Encyclopaedia Britannica, the Britannica Concise Encyclopedia 2010 delivers over 25,000 thoroughly researched and fact-checked entries covering art, history, geography, politics, technology, science, sports, pop culture, and other subjects. Watch topics come to life with thousands of colorful images and maps. Whether you are wondering where Wall Street got its name or when the excavation of Pompeii began, you will find that Britannica Concise Encyclopedia 2010 is the perfect information resource for home, school and the office. Don’t remember the exact spelling of a name, place or event? The advanced “wildcard search” feature allows you to replace unknown letters with symbols, and instantly find the word you’re looking for. The Britannica Concise Encyclopedia 2010 for iPhone/iPod Touch/iPad is available for 19.99 USD (15.99 EUR) via download from the AppStore. Encyclopaedia Britannica, Inc. is a leader in educational publishing. The company’s encyclopedias and other products can be found in many media, from the Internet to wireless devices to books. A pioneer in electronic publishing since the early 1980s, the company still publishes the 32-volume Encyclopaedia Britannica, along with educational online services such as Britannica SmartMath and Britannica Online School Edition and new printed products such as Britannica Illustrated Science Library. The company makes its headquarters in Chicago.